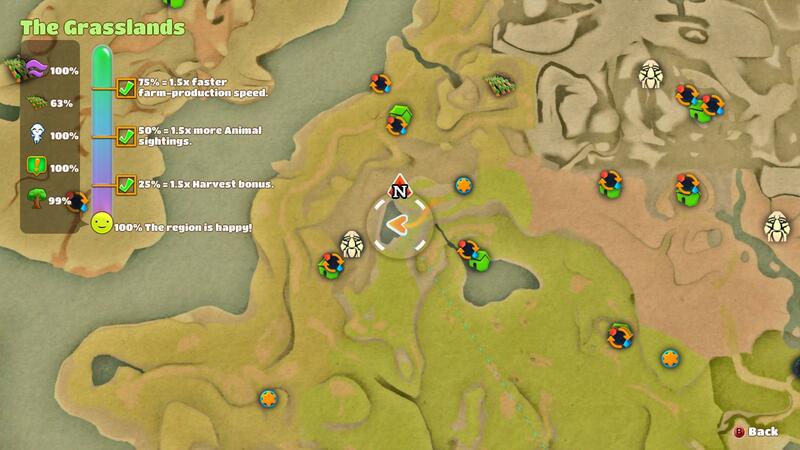 Learn where and how to find and catch all the fishes. 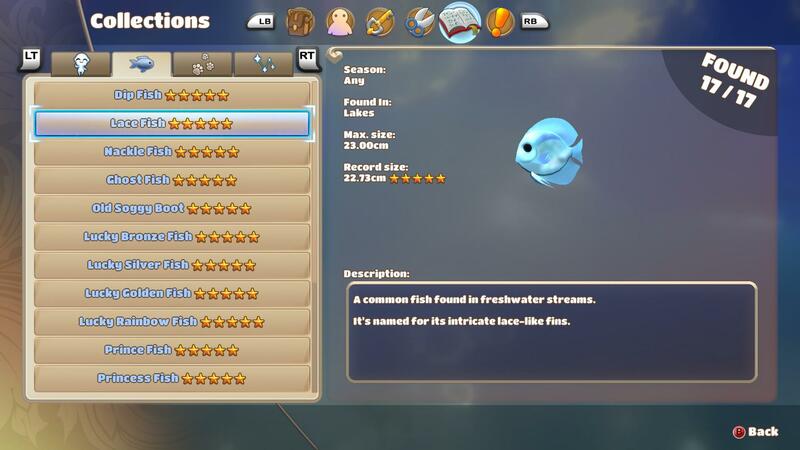 Trying to find all the fishes in the game can be quite a long search and involves a bit of luck so knowing where you should cast your line can save you hours of your time if you just want to get the fishing achievement. 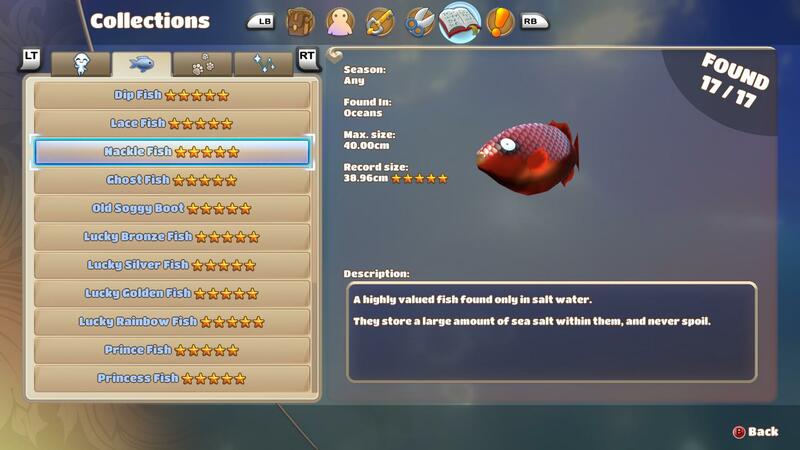 I will first introduce all fishes in the game and after that I will show the places that I found after hours of fishing to be the most promising fishing locations and what fish you will find there. Please note that I also describe how to differentiate the fishes which for example will be quite helpfull when looking for the Lucky Rainbow Fish. 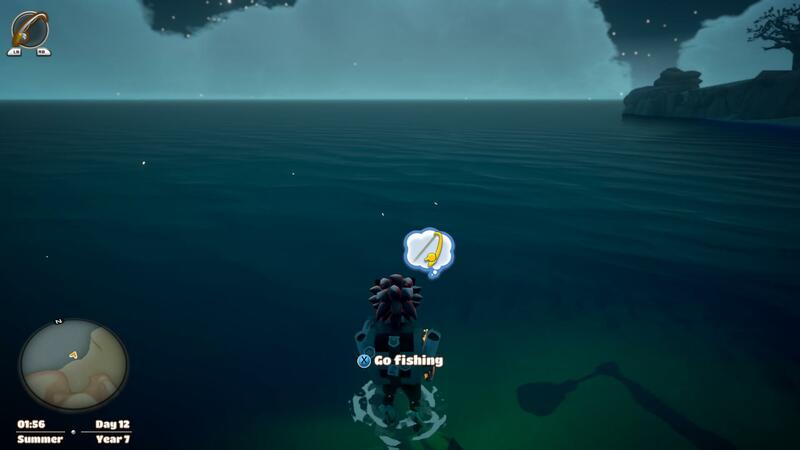 If you cast your fishing line then fishes will start spawning in the water and will swim around there until you catch one or pull out your line. 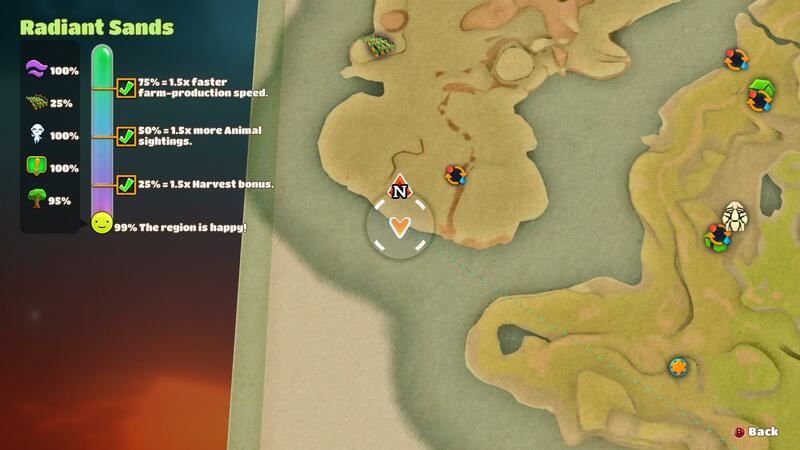 Up to 6 fishes will spawn and if you fail to catch one all will swim away and up to 6 new ones will spawn. The different fishes will also look different in the water so if you have some experience and look at the shapes and sizes of the fishes swimming around, then you can easily tell what fishes they are, this is especially important if you are trying to catch a particular fish. I am going to tell you on what details to look to be able to differentiate the fishes even if they seem to look really similar. To get a fish interested in your bait you have to dangle it in front of its face but be carefull, as soon as they are interested in your bait they will follow and try to catch it so if you are aiming for a particular fish be careful that you are not accidentally get other fishes interested as well. The Dip Fish can be found anywhere, even in salt water. 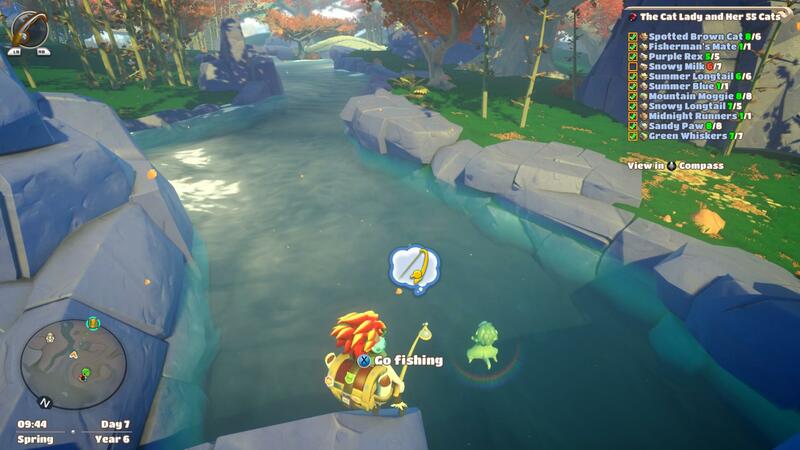 Just like the ingame description says, this fish will get interested in the bait pretty easily so it is more of an annoyance since it will often try to bite while you are trying to hook another fish. The Old Soggy Boot doesn't actually swim around in the water like other fishes but instead it has a small chance of replacing any fish you catch - yeah, ANY fish. 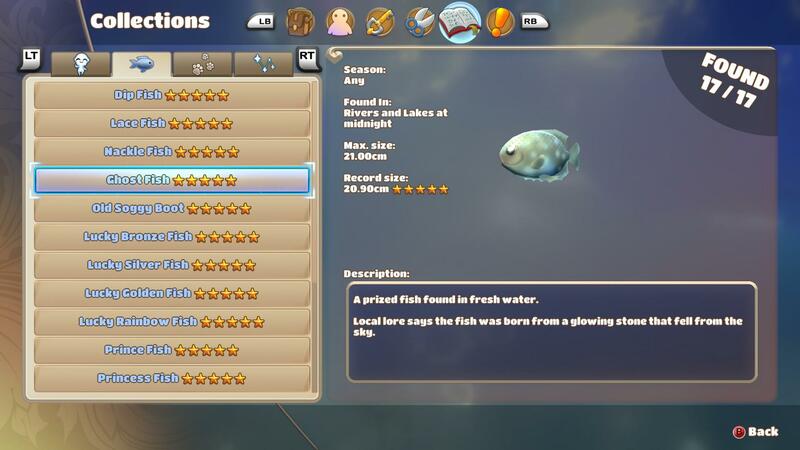 If you are unlucky then the Old Soggy Boot might replace a rare fish which you hooked with great difficulty. If you are aiming for a 5 stars Boot then you just have to fish for quite a long time till luck smiles upon you. The Lace Fish can be found in any fresh water lake or river. They look kind of similar to a Dip Fish but are just a little bit bigger and have noticable fins at the sides of their bodies. They are a bit harder to get interested in your bait. The Ghost Fish can only be found at night around midnight. I am not exactly sure about the exact timing where they can spawn but they definitely spawn from 11pm to 1 am and probably even before and after that. They look kind of similar to Lace Fishes and their size is also comparable. Since Lace Fish also do spawn at night it is easy to mix them up so look at their form and their fins and you will see differences. The Prince Fish is a rather fast swimming fish and it has a big, elongated form so it can easily be spotted in the water. Since this fish swims rather fast and is big it is not that easy to hook it, so just be patient and evade other fishes. The Princess fish is rather similar to the prince fish, similar size and swimming speed, but since they can usually be found at different bodies of water it is pretty easy to know which it is that is swimming around in the water. Since this fish swims rather fast and is big it is not that easy to hook it, so just be patient and evade other fishes. The King Fish looks similar to the Prince- and Princess fish but is noticably bigger and faster. It can be quite difficult to hook it since he swims faster that your bait and thus it is hard get the bait in front of it to get it interested. But as soon as it is interested in the bait it is difficult to avoid it trying to bite so be careful if you are trying to catch other fish. The Queen Fish is similar to the King Fish but can be found in different bodies of water. It can be quite difficult to hook it since he swims faster that your bait and thus it is hard get the bait in front of it to get it interested. But as soon as it is interested in the bait it is difficult to avoid it trying to bite so be careful if you are trying to catch other fish. The Fulgur Fish is a pretty big fish, in fact it is so big that even Queen- and King Fishes dwarf next to it. The only Fish that is bigger than the Fulgur Fish is the Gigalev Fish. So when a Fulgur Fish spawns you will instantly notice. 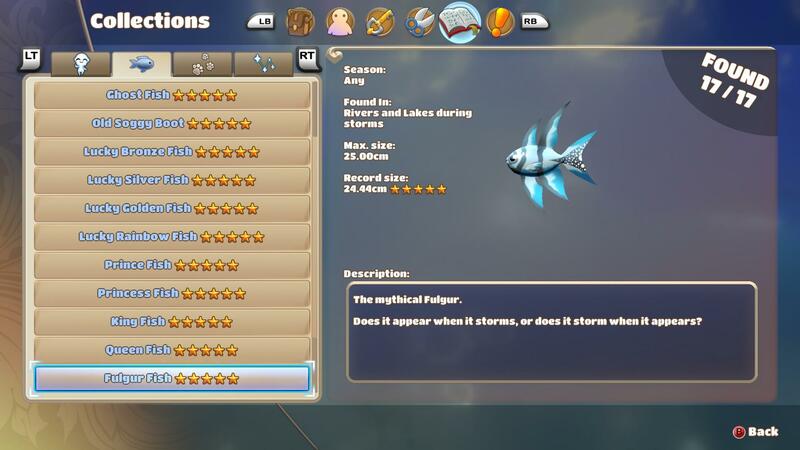 The Fulgur Fish usually spawns quite frequently if the weather is stormy but I also found it when it was sunny weather, the reason for this may be that there was a storm elsewhere on the island or that it has a small spawn chance even without a storm being present or maybe it is simply a bug. The only difficulty in catching this fish is that is pretty big. Since it is so big it is not that easy to find the right spot to place your bobber to get it interested and it may also hide other smaller fishes under its body which in turn might get interested in your bait without you noticing. 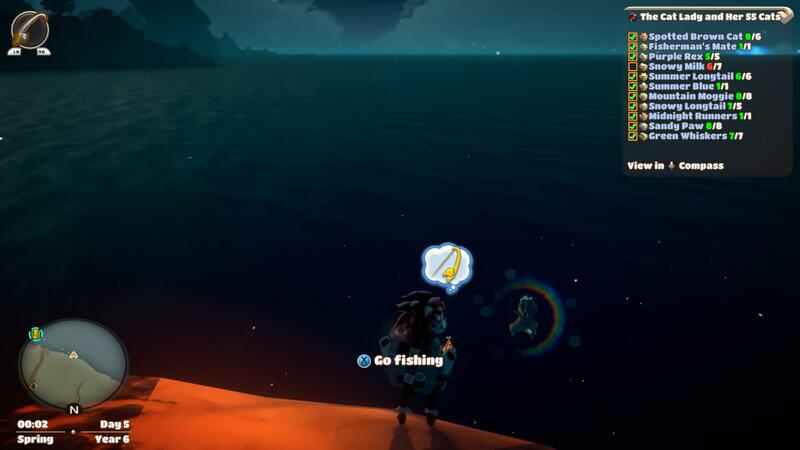 The Yin Fish spawns only at dusk. While I was trying to get a 5-star Yin Fish I noticed that its spawn time is around 5pm - 7:30pm. They have a pretty fat body and look different than all other fresh water fish except the Fulgur Fish but are way smaller than the Fulgur Fish. If you are lucky you may be able to catch up to 2 maybe even 3 of them in one day. It took me quite a long time to actually get it to 5 stars. 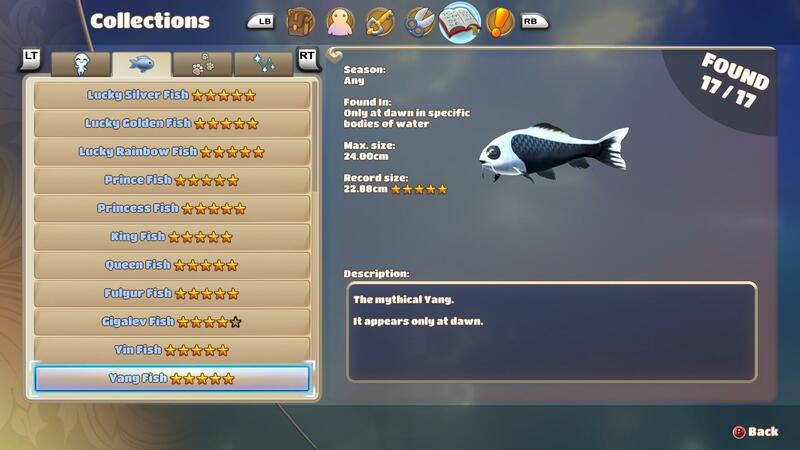 The Yang Fish looks the same as the Yin Fish and spawns only at dawn. It seems to be spawning around 5am - 7:30am. If you are lucky you may be able to catch up to 2 maybe even 3 of them in one day. It took me quite a long time to actually get it to 5 stars. The Nackle Fish spawns quite often can easily be distinguished from other fishes because of its unique looking body. It is pretty long and quite fast. In my opinion this is the most annoying fish in the game (closely followed by the Dip Fish) because the hardest to catch fish also swim in saltwater and the Nackle Fish ruined my catch way too often. Since it is pretty fast and relatively easy to get interested in the bait you will find yourself often trying to evade it while desperatly trying to get the right fish interested in your bait, and even if the fish you want to catch is interested in your bait, when the Nackle Fish is also interested in your bait it can easily ruin it because he is faster. The Lucky Bronze Fish is a fat looking fish that swims pretty slowly. It is easy to differentiate it from the other Lucky Fish because it is noticably smaller, swims slower and it has hook-shaped slit in its rear fin (This slit may be a bug). The Lucky Silver Fish is bigger and faster than the Lucky Bronze Fish but is pretty similar to the Lucky Golden Fish. The only reliable way to tell them apart from their golden cousins is that they have a really small hook-shaped slit in their rear fin. This slit is smaller than the one from the Lucky Bronze Fish and can be hard to notice. The Lucky Golden Fish looks rather similar to the Lucky Silver Fish and while it is a tiny bit bigger and a little bit fast this won't help you in differentiating these two since even if both are there at the same time you will hardly notice the difference. But the Lucky Silver Fish has a small hook-shaped slit in its rear fin that the Lucky Golden Fish has not. For Most players the Lucky Rainbow Fish is probably the hardest to find Fish and since the game doesn't tell you any information about this fish I had to look for it for quite a long time. The Lucky Rainbow Fish looks really similar to the Lucky Golden- and the Lucky Silver Fish, their size and swimspeed is pretty similar. But the Lucky Rainbow Fish has a just like the Lucky Bronze Fish a pretty big hook-shaped slit in its rear fin and can thus be easily differentiated from the others. The Gigalev Fish may not be the hardest fish to find but it definitly is the hardest fish to hook. 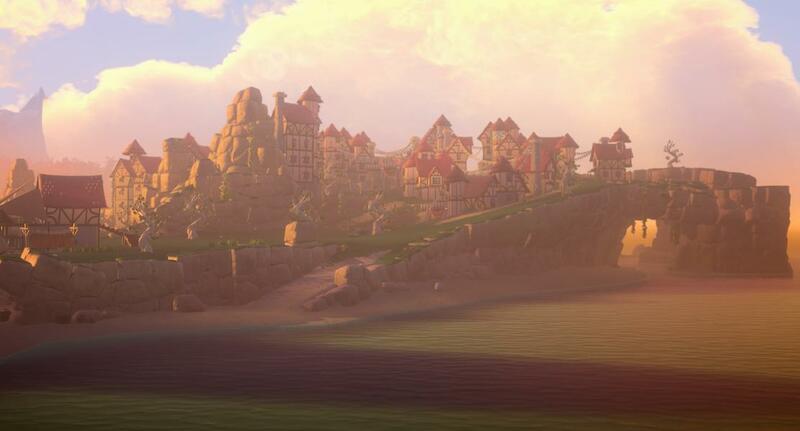 It can only be found in the sea at The Radiant Sands, The Shivering Plains, Hearthwind Vale and Crestfall Coast. This fish is so gigantic that it will take up half of the fishing spot with its body so it is very easy to notice when one spawned. It is so big that it will hide all other fishes swimming around it and will thus hide the fishes that are interested in your bait which makes it hard to evade them. It is really difficult to get this fish interested in your bait and may take a very long time, in fact when you have it finally interested in your bait all other fishes are most likely also interested in it. But even if you have it interested in your bait to actually hook it is really, really difficult an depends more on luck than skill. It is slow enough so that other interested fishes easily swim right next to it and if you just wait for them to bite then most likely another fish will be faster than it. I think I catch about 1 in every 5 spawns, probably even less. Even if there are 2 or more of them swimming around you will still have problems hooking them. As you can see on the screen this one is the only fish I still don't have 5 stars since I didn't have any luck so far even though I already catched more than 10 of these. 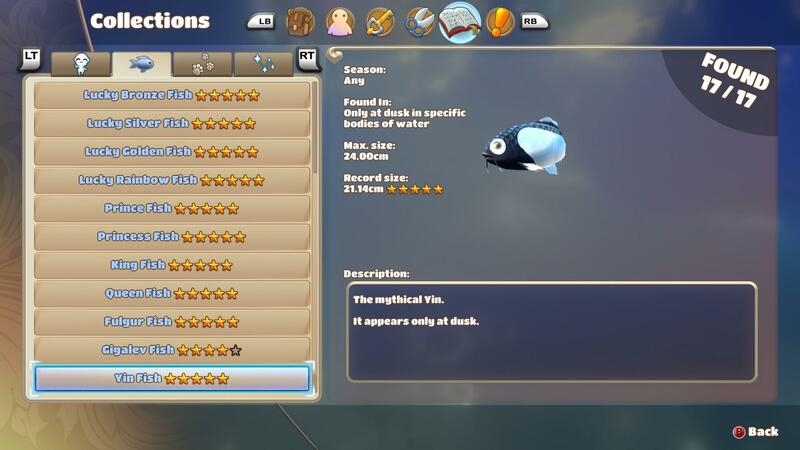 Truth be told, originally I wanted to wait with writing this guide till I had 5 stars for all fishes but I got annoyed from this one after waisting hours upon hours on it. I will still try to get it with 5 stars but it will probably take a bit of time. This river in general is a very good place for catching the Yin- and Yang Fishes, so you will be able to catch most freshwater fishes at this river. Truth be told I never really fished at the river from the fishing competition but since it is downstream from this river it may actually have the same fish. This lake is the only place where I found Queen Fishes. There may also be Yin- and Yang Fishes here but I never saw them. 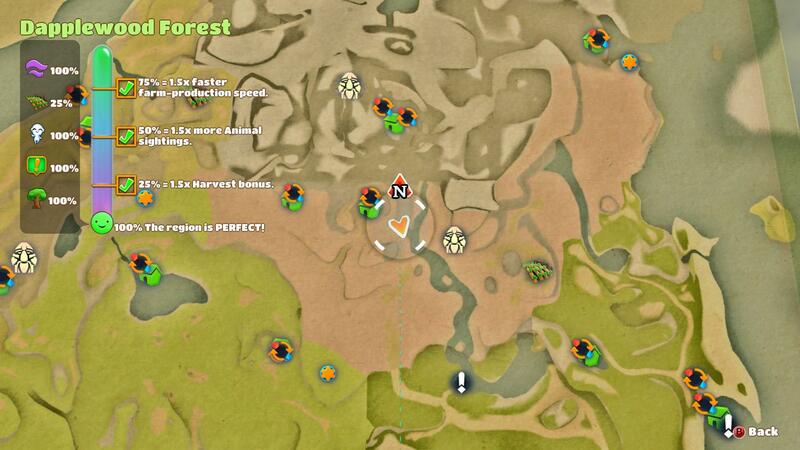 This place is where I saw the most Gigalev spawning. This may just be a coincidence that I saw more Gigalevs here than elsewhere but to me it seems like Gigalevs are spawning here at least two times as much. 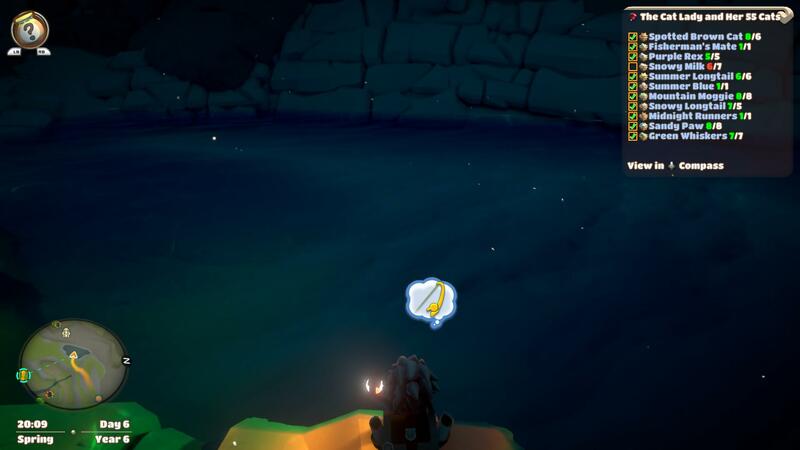 This is the only area where I found Lucky Rainbow Fishes spawning, so you have to finish the reparing the Cloud Catcher first before you can attempt to catch the Lucky Rainbow Fish. 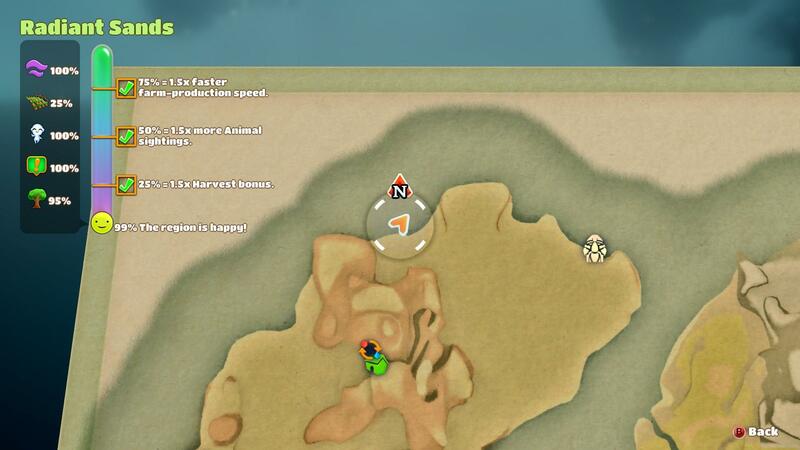 Even though there are also Gigalevs spawning here but they seemed to me to be rarer here than at the other location.